"They Danced with Each Other"
Boozhoo indinawemaaganidog, gidinimikoo miinawaa. Biindigen miinawaa nindaadizooke wigamigong. Hello relatives, I greet you in a good way! Welcome back in my storytelling lodge. The title of the above ring set is ‘‘Ispiming, Nimishoomis idash Nookomis Niimi'idiwag." This is Anishinaabemowin (Ojibwe) for ‘‘My Grandfather and Grandmother Are Dancing in the Sky." The ring set is part of my wedding ring line Debwewin (Truth). The rings are handmade and consist of 14K palladium white gold exteriors. The interior of the men's ring is 14K white gold; the ladies's ring has an inside of 14K red gold. 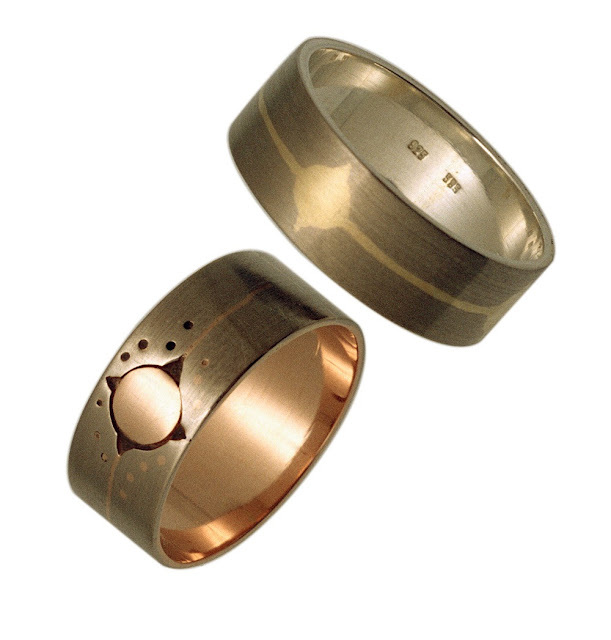 The rings have inlays of red gold (the ladies' ring) and yellow gold (both men's and ladies' ring). Ring width: 0.28 inches (7 mm). The designs of sun and moon (and stars) in these rings are complementary. Depicting the circular paths of the moon and the sun, the inlaid designs symbolize that everything in nature is round or circular. Also do they symbolize the union of two beings under the protection of the Universe and of a new beginning as they contain a promise of warmth, light, growth, and protection. But most of all the designs remind us of how much we are all connected with (and blessed by) GICHI MANIDOO, the Great Mystery of the Universe. The inlaid men’s ring design (top right) – consisting of a matted outer band of palladium white gold and a highly polished inner band of white gold – relates the tale of GIIZIS, the sun. 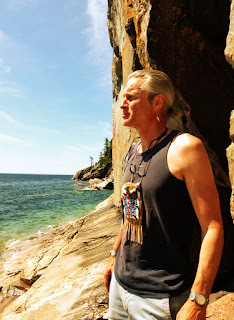 My Anishinaabe ancestors referred to Giizis as He Who Stands above All, and Grandfather of all Life. The overlay women’s ring (bottom left) is also executed in matted palladium white gold but has a highly polished interior of red gold. The ring shows a delicate inlay of red and yellow gold, of three images of DIBIK GIIZIS, the night-sun (moon), encircled by several red gold inlay speckles (dots), symbolizing ANANGOOG, the stars. My ancestors referred to the night sun as Wezaawigiizhigookwe, Yellow Sky Woman, our Grandmother or Mother of all Mothers, representing the primacy of all women on earth, and the prominent role that women play within their communities and families. The men’s ring displays three images of the radiant sun, which I made of inlay of white gold subtly blending into yellow gold. These images are interconnected by a single ‘‘spirit line’’ consisting of yellow gold inlay; they are an expression of the sun’s awe-inspiring powers of giving light for guidance, and heat for growth. The three interconnected images of the sun distinguish the three phases or positions of the sun as he dances his daily cyclical dance: WAABANONG, the east, where he rises; ZHAAWANOGIIZHIG, the southern sky, along which the sun performs his daily ritual; and NINGAABII'ANONG, also called BANGISHIMOG, the west, where the sun sinks behind the mountains in the sea. Each new day Grandfather Sun performs His ritual dance from East to West, and as He gives and withdraws His light, the flowers, the trees, the grasses and the fruits of Mother Earth answer abundantly and without reserve. Thus the circle of birth, decay, and rebirth remains unbroken. The grayish matted finish of the palladium white gold surface of the men’s ring is emblematic of the lead grey blanket of gloom that still covers the northern land when the warlike prevalence of BIBOON – the Spirit of Winter – ends; meanwhile, the subtly contrasting yellow gold sun images refer to the promising arrival of ZIIGWAN, the Kind-hearted Sprit of Spring. The white color of the highly polished palladium white gold interior of the ring refers to the clear light of sunrise in the east, the beginning of each new day on earth. The women’s ring presents three red gold images of the monthly phases of the moon: a GIIZIS BAJISHKIWINE (crescent, not visible on the photo), GIIZIS AABITAAWIZI or a half moon – indicating she is in her first or last quarter, not visible on the photo – , and GIIZIS WAAWIYEZI or the full moon (represented on the photo as a radiant moon). The giizis badjishkiwine and the half moon, owing to a subtly fitted inlay of yellow gold, give the impression they're surrounded by a mysterious glow; the full moon shows her identity as ‘‘night sun" by showing four eccentric rays. The color of the palladium white gold women’s ring exterior stands for the calming moonlight at night. The ‘‘spirit line’’ connecting the three moon phases consists of inlay of red gold, producing a beautiful subtle contrast against the matted color of the ring shank. Specks of red gold, symbolizing the stars or the wiigiwaaman (wigwams) of the Sky Spirits, accompany the three moon figures. The highly polished red gold interior, in conclusion, relates to the flaming glow of waaznoode, or niimidiwag, the northern lights. This natural phenomenon my ancestors associated with – and interpreted as – spirits of dead relatives, or pathways or camp fires (lighted by the grandfather to stay warm in winter) to the soul. Within living memory the sheen of waaznoode can be seen in the northern skies, sometimes faintly, sometimes very clearly.